Matcha Collagen. “Thanks to postpartum hair loss I found my new love, Matcha Collagen. As a morning ritual, I throw some Matcha Collagen, warm oat milk, and coconut oil into the blender and enjoy in a pretty mug.” Vital Proteins Matcha Collagen, $47, Amazon. Dot Menstrual Cup. 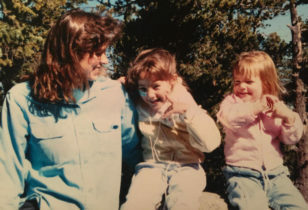 “I was so terrified to switch from tampons to a menstrual cup, but I also couldn’t deny that tampons are extremely wasteful and making the switch was something I had to do. I experimented with a few different cups until I ended up with this one. Now I literally recommend it to everyone.” Dot Menstual Cup, $32, Amazon. Noble Waffle Sleeper. 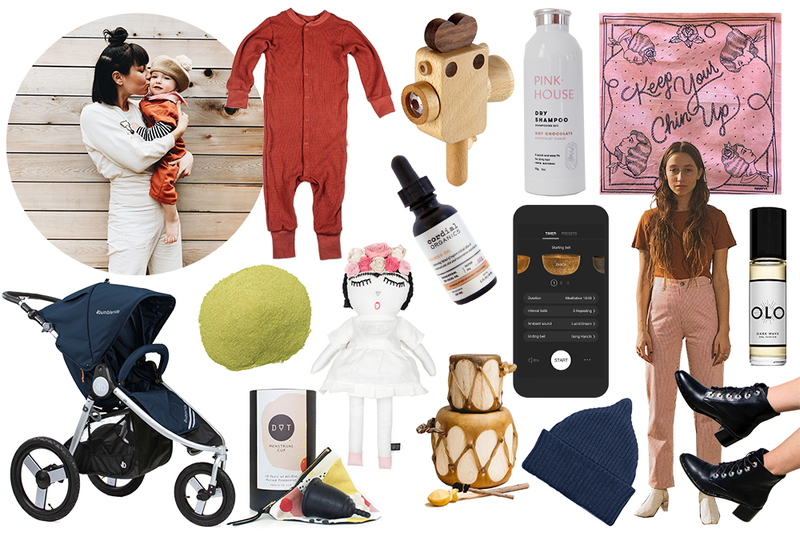 “These Noble waffle PJs are made with organic pima cotton exclusively for Noble Carriage and dyed with actual plants, like indigo, sandalwood, and henna. They are designed based on those vintage long johns we are all nostalgic for and are the perfect weight so your babe doesn’t overheat at night.” Noble Waffle Sleeper, $45, Noble Carriage. Frida Kahlo Doll. “I love everything Frida Kahlo stands for and this handmade organic doll fits perfectly in my budding feminist’s Mexican-inspired nursery.” Frida Kahlo Doll, $85, Noble Carriage. CBD Face Oil. “The air is very drying in San Diego, so having a face oil is essential. This one was concocted by two talented females here in San Diego with CBD to decrease inflammation. It also smells like heaven and instantly calms me.” Cordial Organics Nourish Facial Oil, $44, Cordial Organics. Little Drums. “Sofia is obsessed with music, so she was super excited to receive this drum for her first birthday.” Native American–Made Log Drums, $27, Gunn & Swain. Baby Beanie. “I have a deep love for anything Wes Anderson, so when I first spotted this beanie I knew it would be a staple in Sofia’s wardrobe. She has been rocking it from birth in every color.” James Street Port Beanie, $30, Noble Carriage. Noble Utility Suit. “This Noble workwear-inspired utility suit is made with super soft organic cotton canvas and dyed with plant-based dyes. The organic canvas fabric makes this a piece that can hold up to a child’s play.” Noble Utility Suit (available mid February), $95, Noble Carriage. Wooden Kaleidoscope Camera. “I love a good wooden toy for Sofia and I especially love that these little Super-8 cameras have a kaleidoscope as a lens.” Father’s Factory Wooden Super 8 Camera, $52, Noble Carriage. All-Natural Dry Shampoo. “I used to never use dry shampoo because most contain tons of chemicals and I’m not the best at mixing that white powder into my dark brown hair. Now I’m thankful for this all-natural dry shampoo for brunettes.” Pink House Dry Shampoo in Hot Chocolate, $18, Shop Pink House. Insight Timer App. “Free meditation for Sofia and I. They have meditations just for kids that I absolutely love.” Insight Timer App, free, iTunes. Lykke Wullf Painter Pant. “Workwear-inspired clothing is my go-to and I love that these are made in Los Angeles by a designer who has been dedicated to sustainable fashion even before it became a buzz word. I own a pair of Lykke Wullf organic overalls that I wear regularly and this is the next item on my list.” Lykke Wullf Montaña Painter Pant, $220, Lykke Wullf. APPRVL Bandanas. “I literally put a scarf on Fia’s head or neck every single day. I love that these have a motivational saying on them and are dyed with all natural plant dyes in Brooklyn.”APPRVL Bandana, $25, Noble Carriage. Olo Dark Wave Perfume. “I’m not a huge fan of any type of scent other than simple essential oils, but I love how subtle this unisex scent is by Portland-based perfumer Olo.” Olo Dark Wave, $45, Olo. Freda Salvador Boots. “After eyeing these boots for a very long time I finally splurged on a pair and now I’m addicted. When I put them on I feel like an instant badass.” Freda Salvador Ace Lace Up Boots, $545, Freda Salvador. Tradlands Sweatshirt. “Now that I’m chasing around my babe most of the day, I live in jeans and a sweatshirt. This one stands up to lots of washing and still maintains a beautiful cream color. Bonus points for being made by a female-led company here in San Diego.” Tradlands Varsity Sweatshirt Shell, $69, Tradlands. For more on Jennifer, check out her inspiring Instagram feed for Noble Carriage and her personal feed. 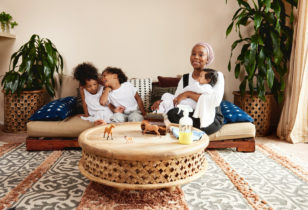 And for more Mother Essentials, peep our past columns with journalist Qimmah Saaffir, author Ylleya Fields, artist Kindah Khalidy, jewelry designers Lauren Godfrey and Maggie Gavigan Smith, Oakland retail queen Sherri McMullen, PR pro Priscilla Vega, Courtney Klein of Storq, Joanne Encarnacion, LaTonya Yvette, Morgan Walker of Make.do, Jeanne Chan of Harlow & Grey, and more.